The House Cleaning (Maid) Invoice Template is used by maids, house caretakers, janitors, and other types of cleaning professionals to charge their clients for their cleaning services. They typically clean houses, apartments, offices, commercial buildings, schools, and government properties. Completing the invoice requires only a few steps, the most important being a brief description of the job, the number of hours (or cleaning sessions), the cost of a session (or $ / Hour), and their sum. In general, you should be charging between $20-45 for an hour of cleaning. Step 1 – Download the Cleaning Invoice in either PDF (.pdf) or Word (.docx) format. Step 2 – At the top of the document, enter the details of the cleaning company. This includes the company’s Name, Address, Phone Number, Email, and Website. Step 3 – Below the first line, enter the client’s Contact Information and the Date that the invoice will be issued. Step 4 – Next, enter the services rendered for the client in the table. 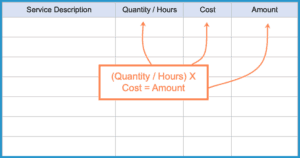 Start with a short Description of the job done, then enter the Number of times the job was done (or the number of hours involved with the task), the Cost per job (or the hourly rate), and finally, multiply the two values to find the value for the Amount cell. Step 5 – Once you have entered all of the services that you will be charging for, add in any Taxes or Other costs and add it to the sum of the ‘Amount’ column to find the TOTAL invoice amount. Step 6 – Finish up the invoice by entering any Notes for the customer. This is where you should enter the number of Days the client has to pay the invoice as well as any Payment Instructions for the client. Additionally, you can enter any notes you have regarding the cleaning or a thank-you for choosing your service.